Rabbi Eli Backman and SGA President Jonathan Allen talk under the menorah on McKeldin Mall, Sunday, Dec. 2. Brogan Gerhart/Mitzpeh. The first candle was lit on the 10-foot tall menorah on McKeldin Mall, celebrating the beginning of Hanukkah, Sunday evening. This year’s annual candle-lighting ceremony held special significance to many of those in attendance, as this Hanukkah is being celebrated a little over a month after the Pittsburgh synagogue shooting. Rabbi Eli Backman opened the lighting by talking about the menorah as a symbol for how a little goes a long way in the quest for peace. After speaking, Rabbi Backman introduced President Wallace Loh who wished everyone a happy Hanukkah, and talked about the celebration as a symbol of hope for the Jewish community and as a way to remember those who had fallen during the attack in Pittsburgh. 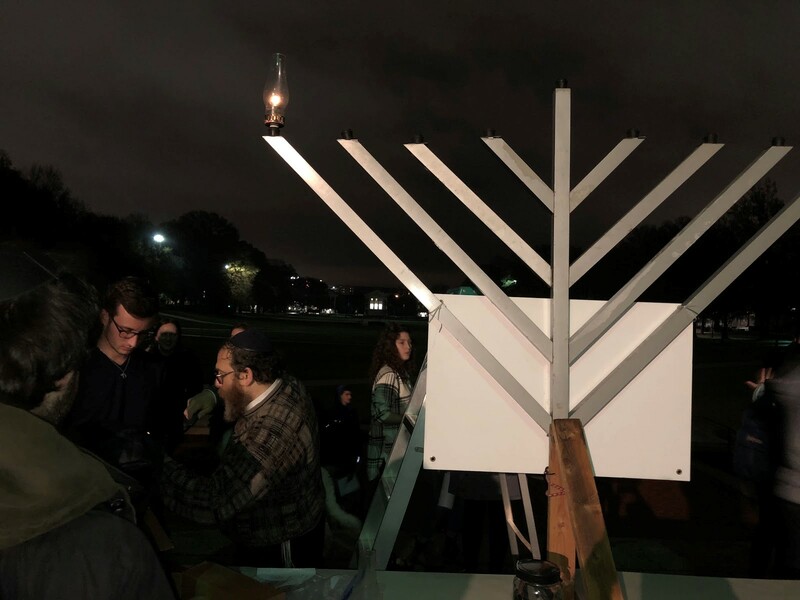 SGA President Jonathan Allen had the honor of lighting the menorah during this program’s 22nd year on campus and its second in front of McKeldin Library. After the lighting of the menorah, students enjoyed hot latkes and gelt (chocolate coins) as they ate and caught up with friends celebrating the beginning of the holiday. Even some non-Jewish students who were studying inside of McKeldin came outside to partake in the celebration of over 100 students around the menorah. Dheesh Nelapatla, a junior computer science and finance major, said that even though he isn’t Jewish, it was fun to be a part of the celebration with his friends. Dreidels, personal menorahs and candles were also distributed by UMD Chabad as gifts to the students in attendance. Overall, Allen summed up the celebration by seeing the lighting as a statement made by the entire Jewish community on campus. “Despite what’s going on around the country and the rise of anti-Semitism, we can all unite as a community and be a part of our campus and not shy away and have to do it in our homes or in hiding, but as a sign for the whole community to see,” Allen said. What happened to the Maryland Hillel Center kickoff event? No Replies to "Menorah lighting symbolizes hope in wake of Pittsburgh shooting"